KYIV. 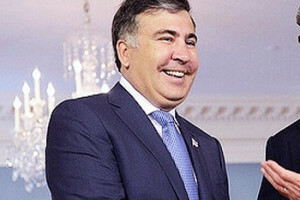 May 31 (Interfax) – Ukrainian Justice Minister Pavlo Petrenko intends to file a defamation lawsuit against Mikheil Saakashvili, leader of the Rukh Novykh Syl political force. “I have made a decision to file a lawsuit based on all those statements that this citizen made regarding the protection of honor and dignity,” Petrenko told a briefing in Kyiv on Tuesday. No one has the right to manipulate, lie, swear and stoop to engaging in populism, he said. “Several parliamentarians and Saakashvili were present in this office [of the justice minister]. I explained to him using very simple language that they had to file a package of documents to register their party. I’m very sorry that this political figure […] has now stooped to the level of a bazaar, street person, who swore, tried to provoke a fight, and behaved inappropriately,” the minister said. Petrenko said he is convinced that such behavior should not take place in a body of state authority. “One can’t use methods of pressure and demand that illegal actions be taken,” he said. According to earlier reports, the Rukh Novykh Syl party is holding an extraordinary congress at the building of the Ukrainian Justice Ministry, in which some 500-700 people are participating. The congress participants demand the registration of the party led by Saakashvili, former head of the Odesa regional state administration. Before the congress, the place was somewhat crowded when law enforcement officials prohibited congress participants from unloading from their vehicles the car tires they had brought with them.